The Limitex AG Hazardous area Rotary limit switch is ATEX and IECEx certified for Zones 1, 2, 21 and 22 environments. 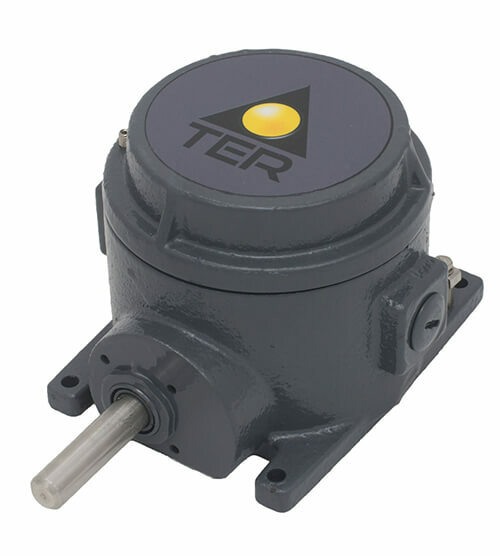 Utilizing a rugged external enclosure made of G20 cast iron, stainless steel transmission and gear driving shafts with self lubricating technopolymer gears and drive bushings. Available in gear ratios from 1:15 to 1:499 by combining secondary output stages. The Limitex AG is available with cam sets complete with 2-3-4 switches with 1NO & 1NC change over contacts. All NC contacts are positive opening for safety. With an IP66 rating and extreme temperature resistance from -40°C to +60°C (-40°F to +140°F) the Limitex AG is a rugged and reliable switch for controlling the movement of industrial machinery in explosive / hazardous environments. Can be equipped with direct control switches for direct connection to the motor.